Click here to view our finest Birch handle mallets for use with Glock, Xylo, Vibes and Marimba. bass drum mallets designed for the concert artist desiring full tonal projection. A RANGE OF MAPLE, NYLON AND ALUMINIUM SHAFT MARCHING MALLETS IN THE MM RANGE. WOOD AND ALUMINIUM SHAFT MALLETS FOR GONGS AND TAM-TAMS. HAND CRAFTED TO THE HIGHEST SPECIFICATION. RAWHIDE & NYLON HAMMERS FOR TUBULAR BELLS AND A SELECTION OF TRIANGLE BEATERS IN THE MS & ME RANGES. 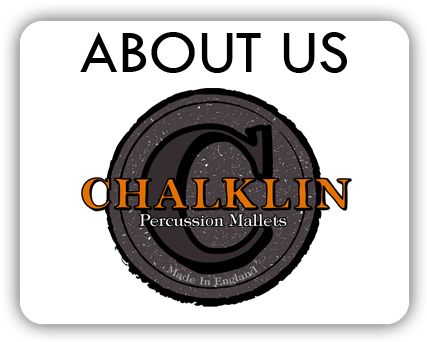 CLICK HERE TO VIEW AVAILABLE ACCESSORIES FROM THE CHALKLIN CATALOGUE.